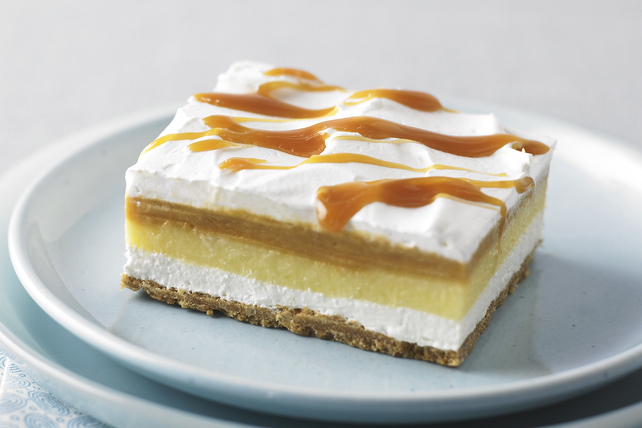 Two favourite flavours come together in this no-bake dessert - a vanilla and butterscotch filling in a buttery graham crumb crust. Mix graham crumbs and butter until blended; press onto bottom of 13x9-inch dish. Refrigerate until ready to use. Beat cream cheese, sugar and 1/4 cup milk in large bowl with mixer until blended. Gently stir in 1 cup Cool Whip; spread over crust. Prepare each flavour of pudding mix with 1-1/2 cups milk in separate bowls, beating with whisk 2 min. Layer vanilla and butterscotch puddings over cream cheese filling; top with remaining Cool Whip. Refrigerate 4 hours. Drizzle with caramel topping just before serving. Substitute Jell-O Chocolate Instant Pudding for the butterscotch pudding, and chocolate syrup for the caramel topping. Save 60 calories and 4g of total fat, including 2g of saturated fat, per serving by preparing with Philadelphia Light Brick Cream Cheese Spread, skim milk, Cool Whip Light Whipped Topping, and Jell-O Vanilla and Butterscotch Fat Free Instant Puddings. Enjoy a serving of this rich and indulgent treat on special occasions.